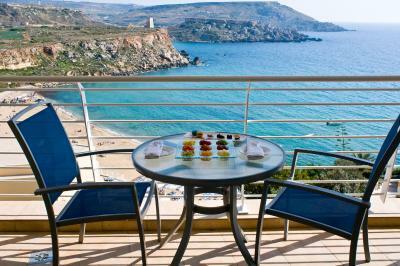 Lock in a great price for Radisson Blu Resort & Spa, Malta Golden Sands – rated 9 by recent guests! Everything was perfect! The view from a Suite is wonderful, amazing, unbelievable! 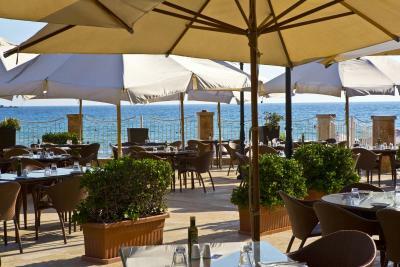 It is also spacios, perfectly clean, breakfast is a 10! The staff is great.. Absolutely fantastic. A gem. Luxury and breathtaking scenery. 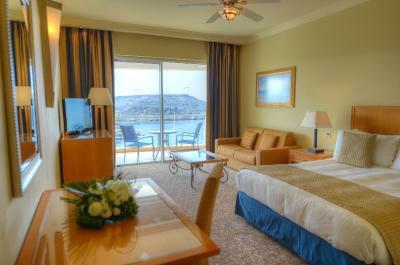 The spacious rooms overlooking the view were breathtaking. 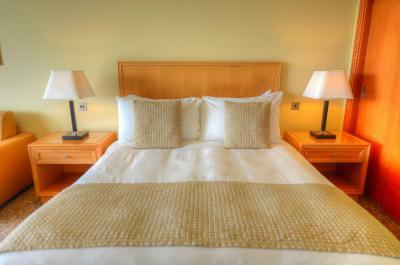 Comfortable beds and spacious bathroom. Great Breakfast with a vast selection. Staff were very friendly and accommodating. Great terraces to lounge and bathe in the sun. 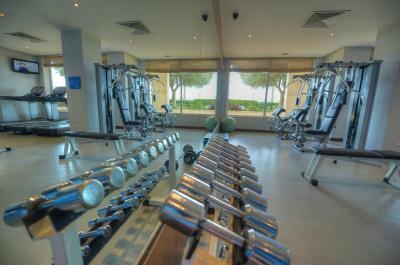 Friendly, helpful and professional staff. 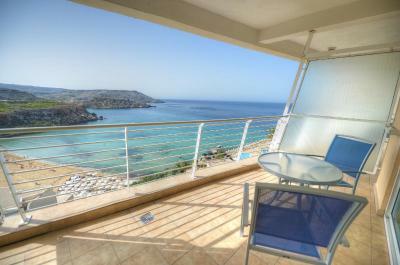 The sea view from the balcony is amazing. Food is exceptional and WiFi is available all over the premises. 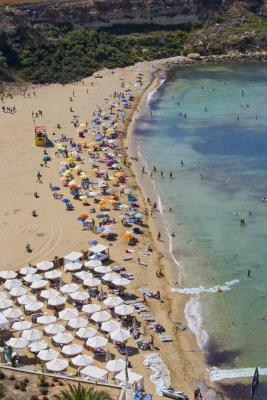 Very supportive and friendly staff; good beach side hotel if you search for relax and to possibility to stay out of city. Hotel has big quantity of different facilities and you always may find what to do if you decide to do something;) Also a plus is that they opened small supermarket on territory. And all territory is very big and very well organized and cleaned. Great location and fantastic beach! Have nothing negative to say. Would stay again! 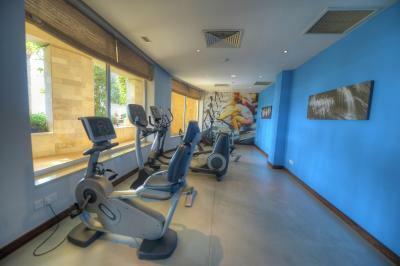 Radisson Blu Resort & Spa, Malta Golden Sands This rating is a reflection of how the property compares to the industry standard when it comes to price, facilities and services available. It's based on a self-evaluation by the property. Use this rating to help choose your stay! 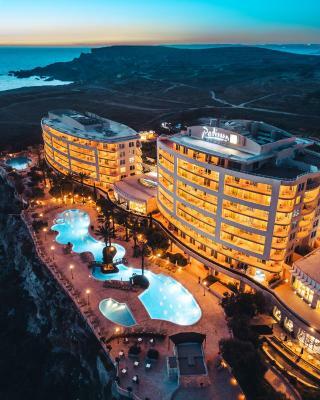 Radisson Blu Resort & Spa, Malta Golden Sands enjoys a quiet, private setting, with peaceful views of the sea and the surrounding countryside. 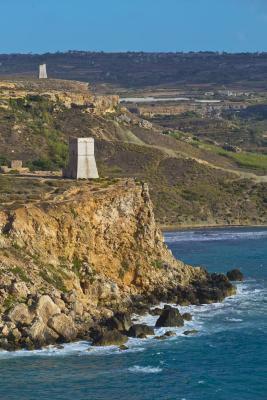 It is a 10 minute drive from the harbor where ferries leave for Gozo. 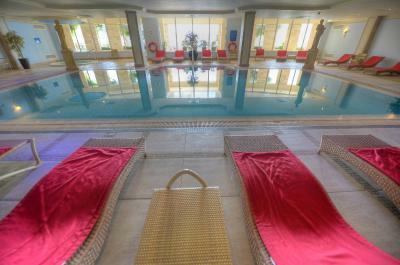 The spa extends over 10700 ft² of space, and the resort's leisure center offers stunning views of the sea from its large windows overlooking the bay. 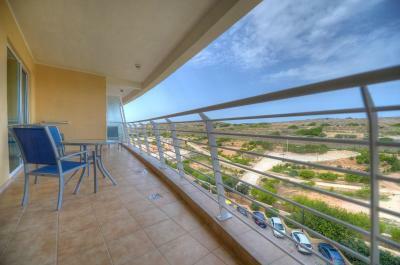 Rooms are furnished with modern decor and offer a balcony with sea or countryside views. 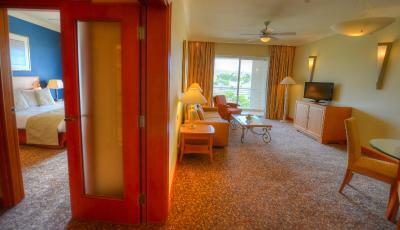 During summer the rate includes one sun umbrella and 2 lounge chairs per room. 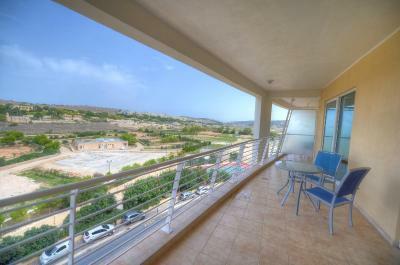 This property also has one of the top-rated locations in Mellieħa! Guests are happier about it compared to other properties in the area. 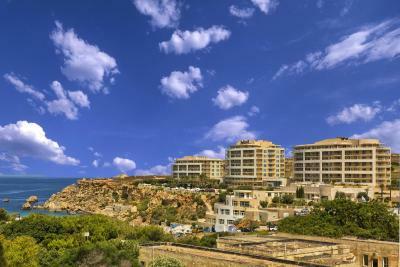 When would you like to stay at Radisson Blu Resort & Spa, Malta Golden Sands? 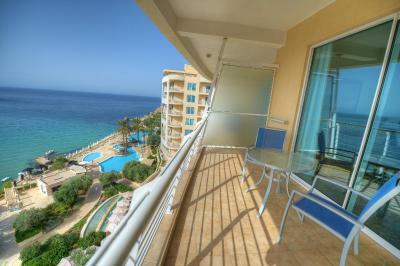 Features a balcony, a flat-screen TV with satellite and pay-per-view channels, and a minibar. 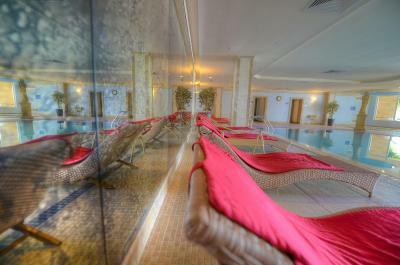 It is air-conditioned and includes soft bathrobes and slippers. Suites come with a kitchen, separate living and sleeping area. Each has a large balcony and free WiFi. 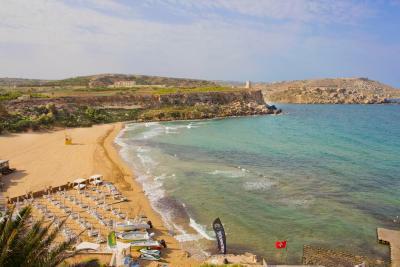 House Rules Radisson Blu Resort & Spa, Malta Golden Sands takes special requests – add in the next step! 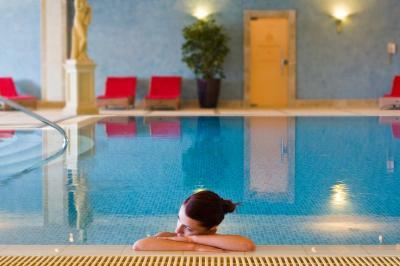 Radisson Blu Resort &amp; Spa, Malta Golden Sands accepts these cards and reserves the right to temporarily hold an amount prior to arrival. Radisson Blu Resort & Spa, Malta Golden Sands accepts these cards and reserves the right to temporarily hold an amount prior to arrival. Only thing was we arrived relatively late at the buffet dinner. Some finished items were not replenished which was a bit of a ket down. Best sauna ever, breathtaking views. Location is excellent, staff were helpful and courteous. I think the beds were not very comfortable. The beach in front of the property is great. What irritated me was the amount of unsupervised children at the pool which did not portray our expected relaxation at the SPA. On the other hand the staff and the treatments at the SPA were fantastic. 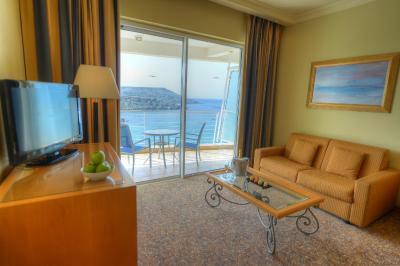 Perfect spacious and comfortable room. we had the best of both worlds a view of the Countryside and the sea. 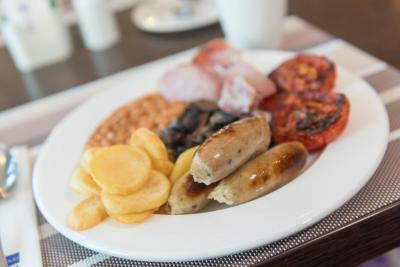 Superb Buffet dinner and a delicious breakfast including gluten free items and the Staff are super hospitable. The water pressure in the shower was very bad and either VERY hot or VERY cold; you can’t shower comfortably. Beautiful view, good service and facilities of Spa was nice. The room could do with a small makeover. Awesome location, awesome view, awesome breakfast! Location - would be good if a free bus transfer was provided. 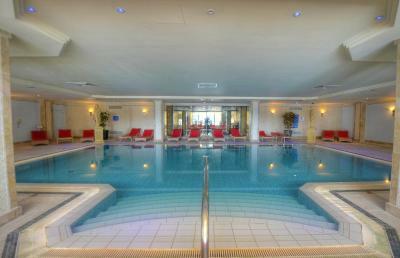 The spa facilities, only 1 jacuzzi. And to go to the indoor pool area females and males have to pass from separate doors to enter the facility. Which was weird and unnecessary. Restaurant Aliolio expected to be much better. service wasn't as good, the waiters were not professional as you expect in a 5 star hotel. In my opinion the prices for the food were also expensive and the quality of the restaurant was poor in terms of furniture and bars. Waiters were cleaning the dirt off the tables and throwing them all over the floor nearby occupied tables! Breakfast was great, a lot of variety. Bedroom was amazing, it was huge and with an amazing view. We had no idea that part of the hotel was timeshare. 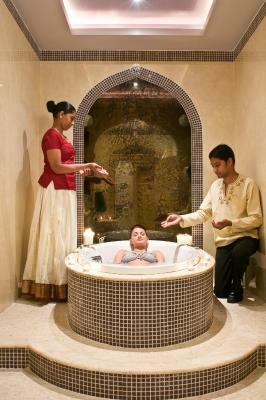 This marred the whole ethos of the site and was not what we had expected from such a high class establishment. Signage was very poor, especially as our suite was a good 10 minutes walk and a lift from the main reception area. Checking in was a long wait as our accommodation wasn’t ready...we were told it wouldn’t be too long but it took over 2 1/2 hours, despite us asking several times if it was ready and when! This spoilt our initial impression of the hotel complex and wasted several hours of our short four day stay reducing it to three days! We had a suite of rooms, sitting room, kitchenette, bedroom, large bathroom and a balcony overlooking the Golden Sands Bay; the accommodation was lovely although some furniture needed updating. 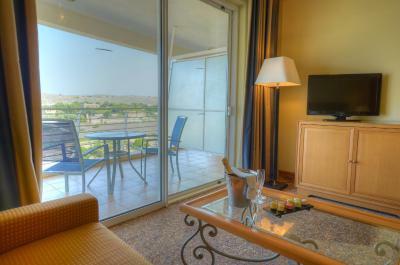 The rooms were cleaned well, towel bathrobes and slippers provided, WiFi was excellent. Breakfast was exceptional, despite the wait for staff to check us in. There was an absolute variety of fruit, pastries, cereals, conserves, charcuterie, hot cooked food, eggs to order, pancakes, beverages...and more and more! Staff were extremely friendly and most welcoming throughout the hotel, greeting us as we passed by. One of the restaurants, Ailolio, also did takeaway food and we ordered pizza which didn’t take too long. Taking the number 44 bus every half hour, a short walk from the hotel, to Valletta (although not always on time) and only costing €1.50 , was very good value for money - a long journey but you see a lot of Malta and life! Locating the return bus stop at Valletta bus station wasn’t easy, B7 bus stop round the left hand corner walking downhill past the main A/C stops at the bus station.